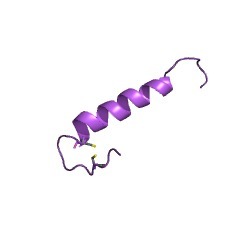 The FATC domain is named after FRAP, ATM, TRRAP C-terminal (PMID:10782091). 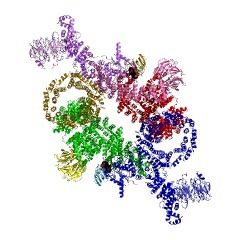 The solution structure of the FATC domain suggests it plays a role in redox-dependent structural and cellular stability (PMID:15772072). 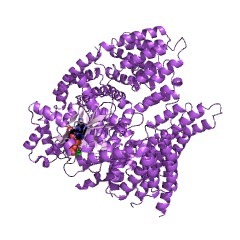 Phosphatidylinositol kinase (PIK)-related kinases participate in meiotic and V(D)J recombination, chromosome maintenance and repair, cell cycle progression, and cell cycle checkpoints, and their dysfunction can result in a range of diseases, including immunodeficiency, neurological disorder and cancer. The catalytic kinase domain is highly homologuous to that of phosphatidylinositol 3- and 4-kinases. 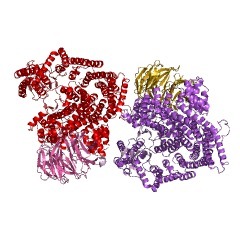 Nevertheless, members of the PIK-related family appear functionally distinct, as none of them has been shown to phosphorylate lipids, such as phosphatidylinositol; instead, many have Ser/Thr protein kinase activity. The PI-kinase domain of members of the PIK-related family is wedged between the ~550-amino acid-long FAT (FRAP, ATM, TRRAP) domain [(PUBMED:7569949)] and the ~35 residue C-terminal FATC domain [(PUBMED:10782091)]. 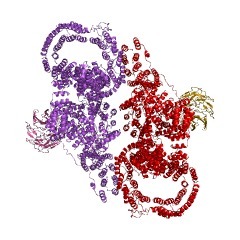 It has been proposed that the FAT domain could be of importance as a structural scaffold or as a protein-binding domain, or both [(PUBMED:7569949)]. 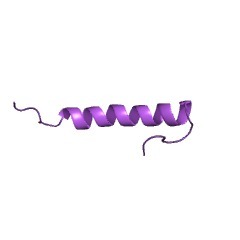 The TOR1 FATC domain, in its oxidized form, consists of an alpha-helix and a well structured COOH-terminal disulfide-bonded loop. Reduction of the disulfide bond dramatically increases the flexibility within the COOH-terminal loop region. The reduction may alter the binding behavior of FATC to its partners [(PUBMED:15772072)]. 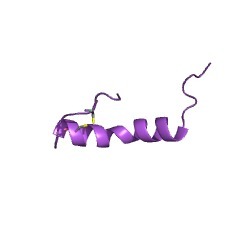 There are 7901 FATC domains in 7895 proteins in SMART's nrdb database. Taxonomic distribution of proteins containing FATC domain. This tree includes only several representative species. The complete taxonomic breakdown of all proteins with FATC domain is also avaliable. Click on the protein counts, or double click on taxonomic names to display all proteins containing FATC domain in the selected taxonomic class. The solution structure of the FATC domain of the protein kinase target ofrapamycin suggests a role for redox-dependent structural and cellular stability. The target of rapamycin (TOR) is a highly conserved Ser/Thr kinase that plays acentral role in the control of cellular growth. TOR has a characteristicmultidomain structure. Only the kinase domain has catalytic function; the otherdomains are assumed to mediate interactions with TOR substrates and regulators.Except for the rapamycin-binding domain, there are no high-resolution structural data available for TOR. Here, we present a structural, biophysical, andmutagenesis study of the extremely conserved COOH-terminal FATC domain. Theimportance of this domain for TOR function has been highlighted in severalpublications. We show that the FATC domain, in its oxidized form, exhibits anovel structural motif consisting of an alpha-helix and a COOH-terminaldisulfide-bonded loop between two completely conserved cysteine residues. Uponreduction, the flexibility of the loop region increases dramatically. Thestructural data, the redox potential of the disulfide bridge, and the biochemicaldata of a cysteine to serine mutant indicate that the intracellular redoxpotential can affect the cellular amount of the TOR protein via the FATC domain. Because the amount of TOR mRNA is not changed, the redox state of the FATCdisulfide bond is probably influencing the degradation of TOR.